social media management/writing (Facebook/Twitter/Instagram)— Hofstra University Continuing Education, LIU Post, 99 Packets; corporate training and public relations—Positive Promotion, LIU Post. Extensive freelance writing credits include trend pieces and reviews for The New York Times Book Review, The Daily News and American Bookseller; woman’s features and travel pieces for Car & Travel, Destination Honeymoons and Weddings, Long Island Bride and Groom, Allure, Jewelry Connoisseur, ModernBride.com, Distinction, Elegant Bride, Parents and Children and Working Woman; news articles for Newsday, Retail Ad World, Time Out New York, Stagebill, The Christian Science Monitor, Entrepreneur.com, Construction Equipment Guide and Good Dog. Freelance Content Writer/Marketing Consultant—Continuing Education (Sept. 2018-present and March 2017-December 2017). Write landing pages to optimize SEO and user experience. Assist in creating marketing plans and a digital strategy. Proofread and correct existing webpages. Improve meta for better SEO. Maintain photo database and provide photo research. Write content for PCP ads, social media, printed materials, scripts and promotions. Interim Marketing Manager (January 2018-August 2018). Advised team regarding marketing plans and digital strategy. Researched advertising/marketing opportunities for five departments. Created Constant Contact campaigns for email and social media marketing. Social media manager and content creator for Facebook, Twitter and blogs. Met with other Hofstra staff to discover opportunities for cross-promotion. Worked with staff to coordinate and develop marketing material, including brochures, advertisements, banner ads, broadcast copy, fliers, postcards and posters – including writing, editing and photo research as well as managing workflow. Associate News Editor (November 2005-January 2007). Worked with writers to produce daily news pieces and editorials. Edited 8-12 stories daily for website. Managing Editor (September 1998-June 1999). Handled all day-to-day functioning of the magazine. Acted as a central liaison between editorial and art departments and production. Supplied creative input to each issue and paginated magazine. Line edited all articles. Developed, researched and wrote articles. Delegated writing assignments to freelancers and other editors and edited their work. Supervised editorial personnel and columnists. Oversaw editorial content, including developing columns and features, assigning articles, copyediting, hiring columnists and trafficking all materials for each issue. Wrote articles, table of contents and cover copy. Broadway Editor (August 1993-August 1998). Coordinated and directed Broadway department editorial and production. Proofread and copyedited Broadway programs. Suggested, researched and wrote articles. Off-Broadway Editor (December 1992-August 1993). Oversaw entire Off-Broadway department including editorial, production and billing. Edited and fact checked all Off-Broadway programs. Worked extensively with press agents, producers and theatre managers. Continuing Education Professor (September 1997-2006; 2008-present). Develop curricula for journalism and writing classes, including all course materials. Teach in Digital and Social Media Certification program. Also, teach continuing education classes in magazine article writing as well as travel, business, memoir, resume and romance writing, playwriting, creative nonfiction, blogging, writing for the web, and interviewing. Assistant Professor/Director of Journalism Program (September 2010–August 2015). Taught reporting, journalism history, web production, visual journalism and others for a 14-week semester. Updated curriculum and program as industry and educational changes necessitated. Implemented and maintained social media for the department. 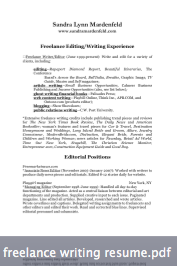 Download a copy of Sandra Mardenfeld’s freelance writing resume.